Join a certified IFMGA mountainguide from Breogfjell for your skitouring around the worlds steepest cable car – the Loen Skylift. Among the greatest skiing i Norway, the skitouring and descents from the brand new Loen Skylift is definetly worth a visit. This brand new cable car brings you straight ut from the fjord to the Mt.Hoven 1000 meter above sea level. 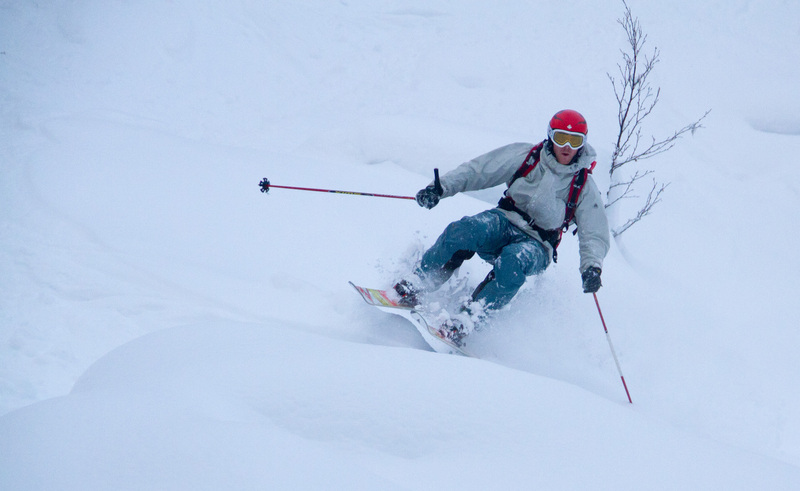 With mt Hoven as the point of the departure, a suite of alpine ski touring opportunities opens ut. 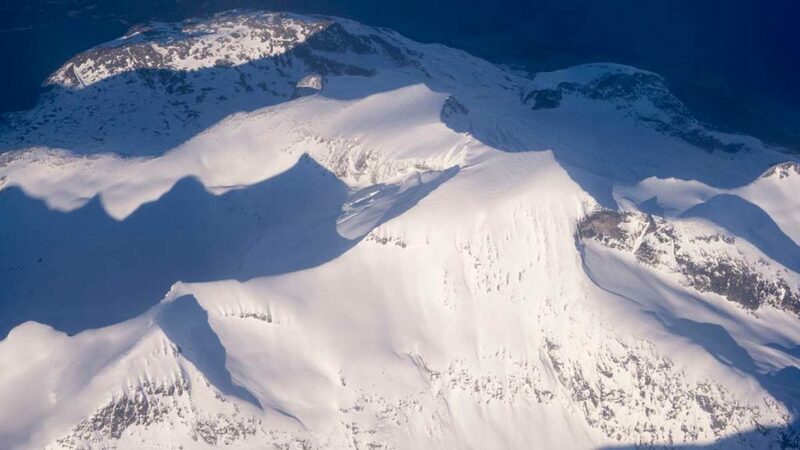 Most of the skiing in this area is in complex terrain and some descents are on glaciers. 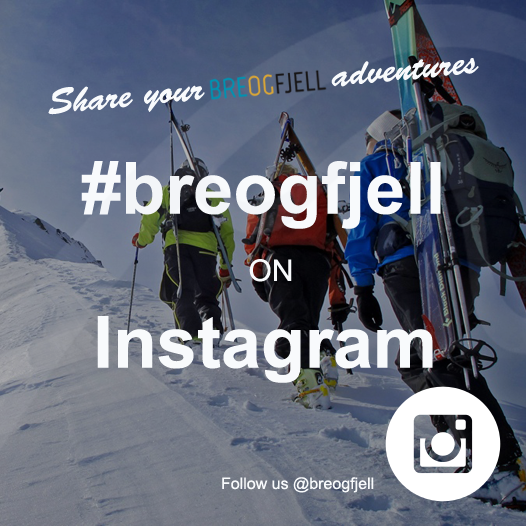 From the top station there is a just 150 vertical meter ascent to Mt.Skredfjellet. 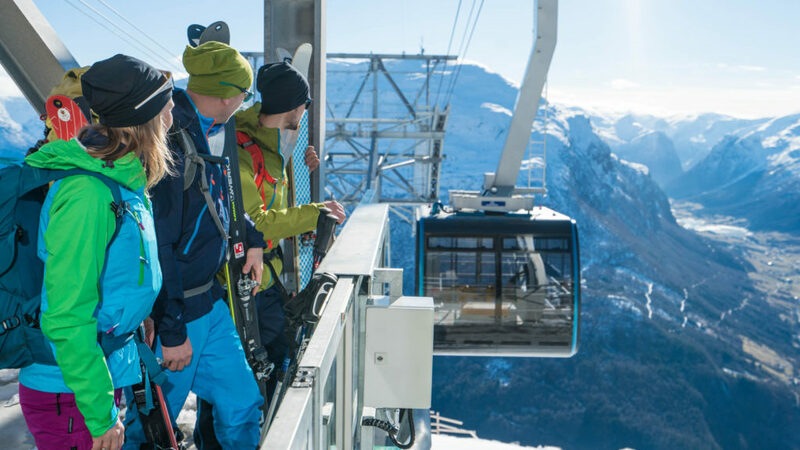 From here we can choose between several descents from betweem 300 vertical meters up to 1000 vertical meters depending on the snow and weather conditions. From the top station we skin up to Mt.Staurinibba (asc 400 vertical meter). 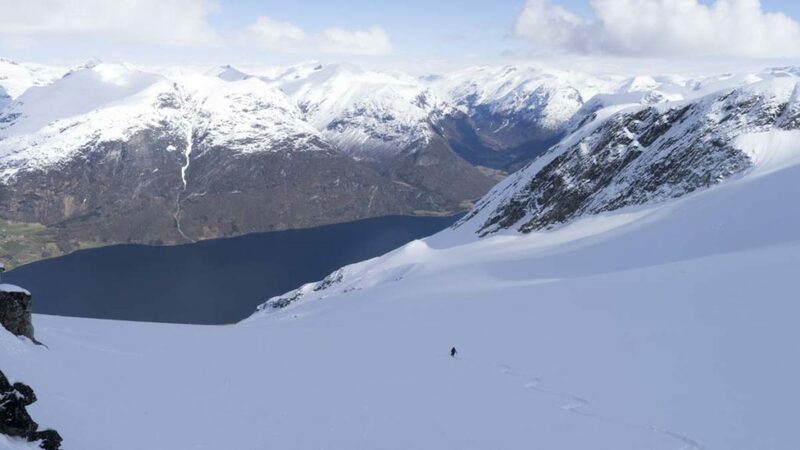 From this peak we will enjoy the stunning fjord view and prepare for the first 600 m descent towards Lohøgsætra. From these small summer farm cottages we can either head back to Loen Skylift or go down to Loen by the fjord, or we can go for a second ascent to Mt.Sundshyrna, Mt.Dispahyrna or Mt.Geitafjellshyrna. From these peaks we can drop down up to 1600 vertical meters to the Stryn Valley. After a day you will have a total dsc of 2000 vertical meters with only 1400 m ascent. We start by using the lifts at Stryn Vinterski to 1000mas. From the top station we hike to Mt.Natakupa (asc 400 vertical meter) before we drop down 1300 vertical meter to the Stryn valley. After a lunch at one of the nice local restaurants – we drive by taxi to the Loen Skylift and finish the day with the medium to long hike alternative. 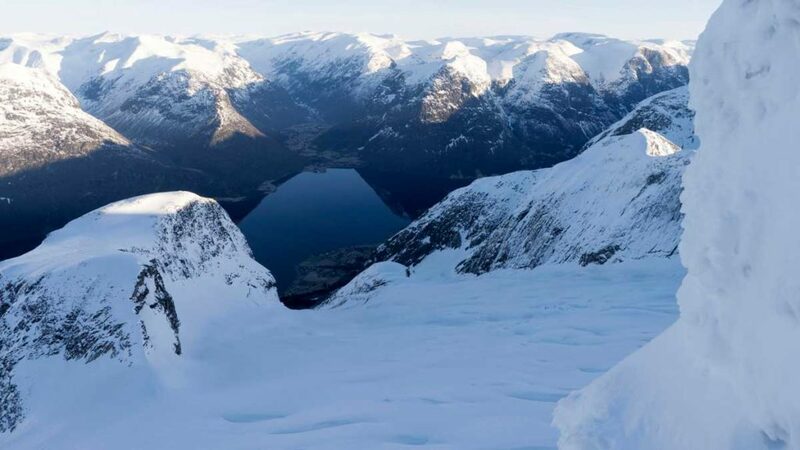 If the snow conditions all the way down to the fjord, you will be able to ski 3300 vertical meters, and skin up 1800 vertical meters. 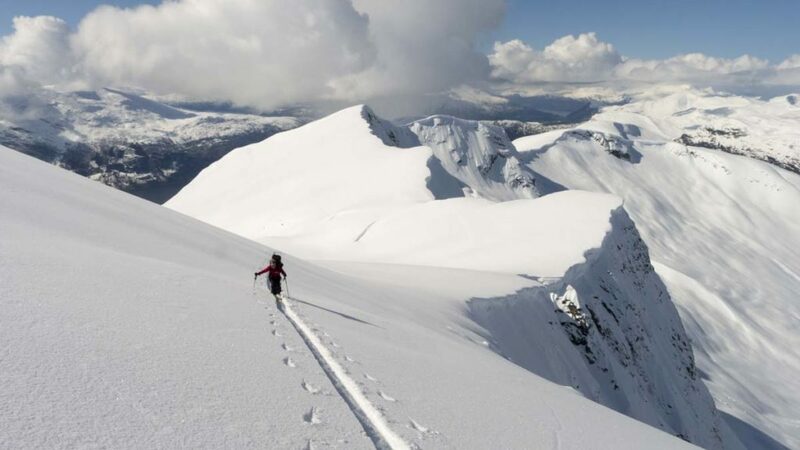 One of the most spectacular traverses in Stryn is the Hoven – Storskredfjellet traverse. This is a long hike with many alternatives. If you would like to do the shortest version, you will have to ascend a total 1400 vertical meters which gives a total descend of 2100 meter skiing. 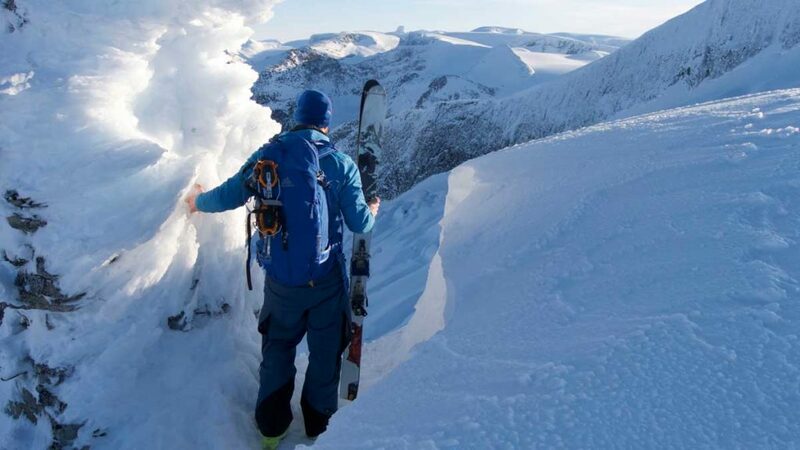 For better skiing it is also possible to drop down many of the valleys on the way to Mt.Storeskredfjellet. The program will be adjusted to meet your skiing/hiking skills and snow/weather conditions. Skiing down from Mt.Storskredfjellet after a 5 hrs hike from Loen Skylift. All guides working in Breogfjell are qualified IVBV/UIAGM/IFMGA mountainguides (called “Tindevegledere” in Norwegian) They also know the area like their own pocket. 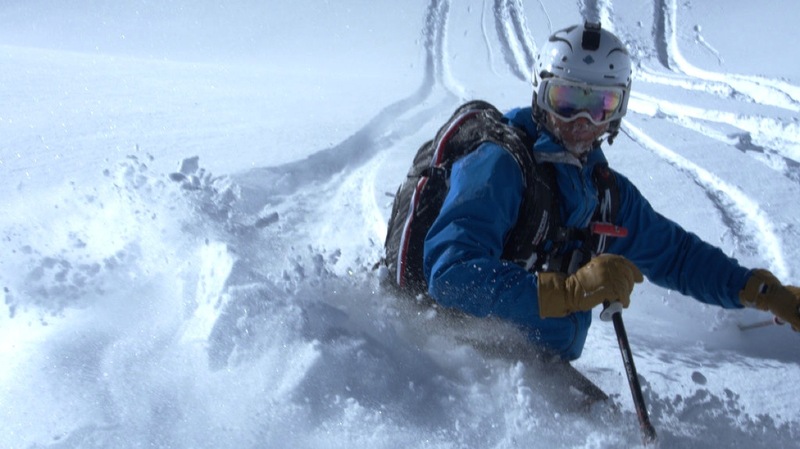 For ski mountaineering we only use IFMGA certified guides or aspirant guides. You can rent all required safety equipment from us. Looking back towards Loen Skylift and the beautiful ski terrain. It´s important for us that you and your friends, family or colleagues get good experiences in the mountains.  “Skill-adjusted tours” is a term we have used in the Norwegian friluftsliv (outdoor life) for years and is central to the trip planning. On this trip you should be comfortable carrying a ski touring day-pack and skinning for several hours. There is likely to be mixed snow conditions on sun exposed or wind blown areas and you should be comfortable skiing through forested slopes. Our guides will adjust the itinerary according to conditions and the group’s wishes. This is a trip for those appreciating their creature comforts after a great day’s skiing. Starting the day with fjord view from Loen Skylift. The Breifonna glacier at Mt.Storskredfjellet. View towards Hjelle and the Stryn Summerski resort. Contact us for an offer for your group! From NOK 1200,- per person. Groups on request all winter! Our guides cater the trips to skiers of all capabilities, from first time skiers to professional skiers. 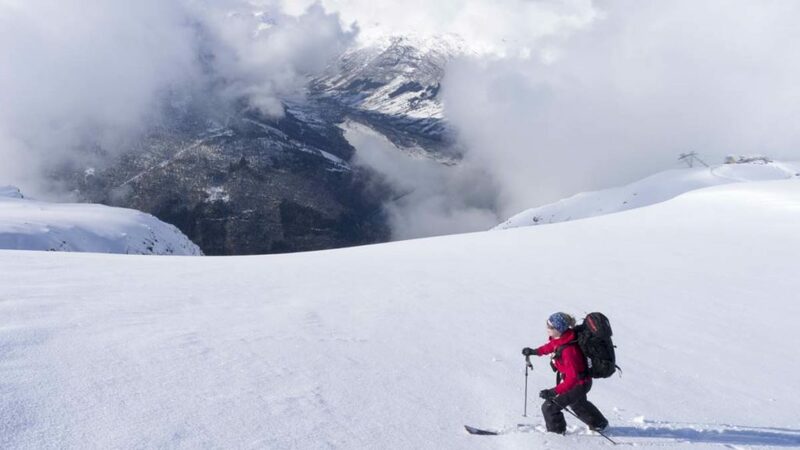 For the Medium to Extra Long hikes you must be experienced with steep skiing on varied snow conditions, and handle use of ice axe and crampons. You must be in a good physical shape!